Young ballerinas, oblivious of war threats on their country, dance to rhythm of Tchaikovsky's Swan Lake. As Baghdad ballet teacher Zikra Minhaim surveys her young charges enthusiastically rehearsing their steps, she sees a glimmer of hope, a rare glimpse of beauty amid the grim war clouds gathering over her stricken city. "What amazes me is when people outside are buying generators, stocking food, the only worry these girls have is how to have a good dancing position and how to stand on their toes elegantly," says Minhaim. "Look in their eyes, you see hope and you see beauty." 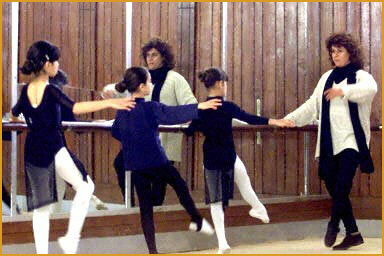 Twenty girls aged between six and 13 take their dancing lessons at the Baghdad School for Music and Fine Arts. In a humble room surrounded by mirrors, the young ballerinas dance elegantly to the rhythm of Tchaikovsky's Swan Lake under a portrait of President Saddam Hussein. Founded in 1969, just a year after Saddam's Baath Party came to power, the school has clearly seen better days. Twelve years of UN sanctions have taken their toll on both the school and the middle classes who used to form its clientele. That the dance classes carry on at all is entirely down to the dedication of Minhaim, who returned from a better life in Europe to foster the school where she herself studied before going on to win a master's degree in choreography in the then Soviet Union, Iraq's Cold War sponsor. "We were four teachers ... During the sanctions we all left, including me - I travelled to Switzerland. But my love of the children and the ballet brought me back to this institution," said the 42-year-old redhead, who is one of scores of graduates of the school to have gone on to win distinction abroad. Minhaim is full of praise for her young pupils' dedication in the face of the difficulties and threats of the world outside. "We have a whole life ahead of us. Despite everything, these girls are trying to make the best of themselves. "Dancing these days has become a kind of escape from the grim realities of everyday life. In our situation ballet is a luxury ... The girls dream of a better life and a better Iraq." Her commitment is amply repaid by her young pupils, who follow her every word in awe and appear desperate to win her praise. "I love to dance. Ballet is one of the things that is beautiful in this life," said 12-year-old Shajwan Kurdiyeh, with a smile on her face and a glitter in her wide black eyes, as she practised in her black leotard. Like ballet schools around the world, the children at the Baghdad School are rehearsing for a mid-year show, but with the difference that here they do not know whether their performance will be to the accompaniment of US bombs. More than 65,000 US troops are already deployed around Iraq's borders poised for a threatened attack and more are on their way. But both Minhaim and her young pupils remain determined that, come war or peace, their show will go on. "There will be a mid-year show - before, after or during the attack, we do not know - but the show must go on."